What happened to Kaiser Wilhelm (1859-1941) after Germany lost World War I in 1918? I'd never given that a thought until I read a witty, sprawling chapter in Ian Buruma's Anglomania: A European Love Affair. (A great read. Highly recommended.) Would the Kaiser fall on his sword? Attempt one last suicidal advance? March on Berlin to crush the revolution? Start a mustache grooming college? No. "Instead," says Buruma, "the kaiser and his entourage, twelve military officers and thirty servants, including his barber, his chambermaids, his butler, his cooks, his doctor, his equerry, and his old cloakroom attendant, 'Father' Schulz, crossed the Dutch border, bound for the hospitality of Count Godard Bentinck's castle at Amerongen. The kaiser's first request, upon his arrival, was to have 'a cup of real good English tea.' He got his tea, served with English scones." The fallen Prussian leader did more than work on his Rococo mustache, which, upturned, always looked like it was ready to take flight. He liked to dress up in various uniforms. He spent a great deal of time felling trees, a sort of compulsive hobby of his called "hackeritis." And he railed against the Jews and the English. Sometimes, he imagined them as one in the same. 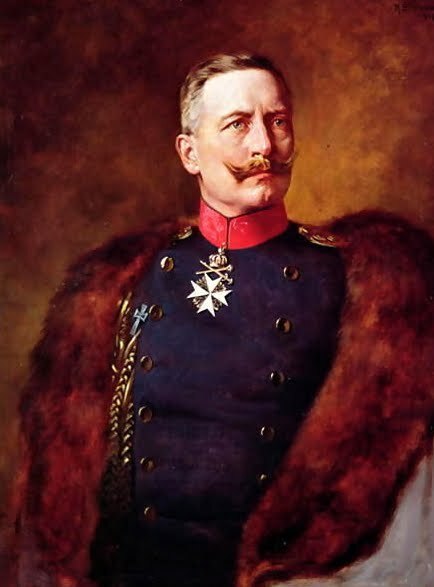 The kaiser was a comic, tragic, repulsive figure. Buruma zeros in on Wilhelm's tortured relationship with the English, and especially his English mother, "Vicky," and his grandmother, Queen Victoria. He vacillated between Anglophile and Anglophobe. Wilhelm was drawn to and repelled by the English and Englishness. In Buruma's estimation, he suffered from a Freudian sense of inferiority. Wilhelm built up the German navy to best his rival across the channel. He thundered against the effete English aristocracy and it's liberal shopkeepers. They were no match for the proud, uniformed, manly, Prussian military man. The whole account would be far more comic if the kaiser's bizarre, super-charged bigotry wasn't shared by so many others in the years before his death. Reading Buruma's chapter gave me a new appreciation for Hannah Arendt's coinage "the banality of evil." what was his barbers name?? ?